There are not too many centre-halves who get to top their club's goal-scoring charts. And especially not a 37-year-old like West Bromwich Albion's Gareth McAuley. The Northern Irishman, who did not make his professional football debut until he had turned 24, is not the sort to go shouting it from the rooftops. But the fact is, along with Venezuelan striker Salomon Rondon, he is Albion's joint leading scorer this season. "I can only think maybe it's the new rules," said McAuley, who has plundered all his seven goals at set-pieces. "People can't get hold of you and they can't wrestle you. Maybe that's a reason why. It's certainly been more difficult defending this season." Admittedly, Albion are a team who have rather spread the goals around this season, their 36 in 26 Premier League games having been shared among 11 different players. It also has to be said that McAuley has always scored occasional goals, wherever he has been, for club and country. But, since the end of last season, during which he netted just once for Albion, he has found the net nine times, including twice for Northern Ireland. Apart from scoring in the European Championship finals against Ukraine, not to mention one in his own net when the Irish made their summer exit against Wales, McAuley also scored in the autumn World Cup qualifier against Azerbaijan. He has scored in Albion's last two games, against West Ham and Bournemouth, to draw level with Rondon on seven - the South American having not found the net in 11 matches since his headed hat-trick beat Swansea City 3-1 on 14 December. With typical good grace, though, McAuley rates his own seven as being really only worth six and a half. "The one against West Ham was only half a goal," joked McAuley. "Jonny Evans got up brilliantly, headed it against the side of my head and it went in. But, on second thoughts, I'll take it. Jonny's younger than me. He's got plenty of years ahead of him to score a few more." Since making his Football League debut for Lincoln City at Shrewsbury in August 2004, McAuley has gone on to make exactly 500 appearances, scoring 42 goals - a tally that rises to 65 when his contributions for Northern Irish sides Linfield, Crusaders and Coleraine, and nine for his country, are added on. He earned Coleraine £10,000 when he signed for Lincoln in 2004, but has not cost a penny in fees since then, with his three subsequent moves, to Leicester City, Ipswich Town and Albion having all been free transfers. Given the Baggies' form in the early part of this season, when they slipped to 15th in late October, just three points above the drop zone, their recovery since has been impressive. 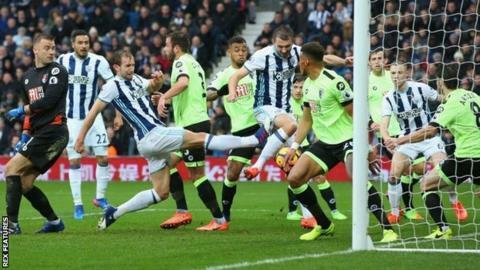 And McAuley's goalscoring efforts have helped put him on course to beat his own career high - eighth place in the Premier League with Albion under Steve Clarke in 2012-13. That was their highest finish since finishing fourth in the old top flight behind champions Aston Villa in 1981, just before then manager Ron Atkinson left for Manchester United. There is even the possibility of a European place, for the first time in 35 years, with Tony Pulis' side eighth in the table with 12 games remaining. McAuley, however, is still taking things very much one step at a time. "The first objective was 40 points, we've got that," he said. "Hopefully we can now go and get past 50 points. It would be a big thing for me and a few of the lads who have been here quite a long time to achieve. After that, who knows. "All we're looking at is a home game next week. Another tough game against a Crystal Palace side who are scrapping for their lives, with us wanting points for another reason." Liverpool full-back Phil Neal netted 90 times, 59 of them in his time at Anfield during his 20-year career, which started at Northampton Town and ended as player-manager at Bolton. Another former England international John Terry's career haul for Chelsea stands at 66, from 713 appearances. The former England captain has also scored six times for his country. Jack Charlton netted 70 goals in 629 games in his 21-year career with Leeds United. He also scored six times for England. Allan Evans scored 51 goals in 380 games in 12 years during Aston Villa's glory days, as well as a further 14 for Dunfermline Athletic. Spaniard Sergio Ramos is just one short of 50 club goals, from 354 games, mostly with Real Madrid, having started it all off at home town club Sevilla. Gareth McAuley was talking to BBC WM's Rob Gurney.